This was the original kit made in the mid 70's. Considering the period it was molded, some of the kit actually fit pretty good while some was terrible or lacked any detail. The most notable areas needing help were the landing gear and wheel bays, the Martin Baker ejection seat, canopy fit, cockpit side details, lack of weapons mounting hardware, and fit of the main wing with the engine access panel. I attempted to eliminate most of these errors with some scratch building. 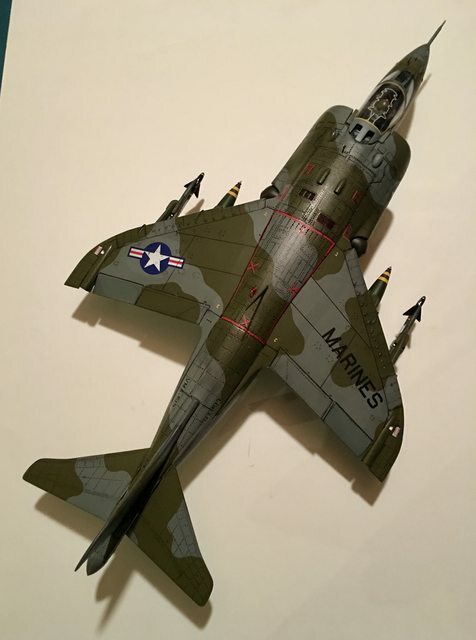 It is not my best work, but it is by best 1/24 Airfix Harrier (and only 1), so that will have to do. I have other versions in different scales. It will be interesting to see how this one stacks up to the others. Excellent cockpit details. 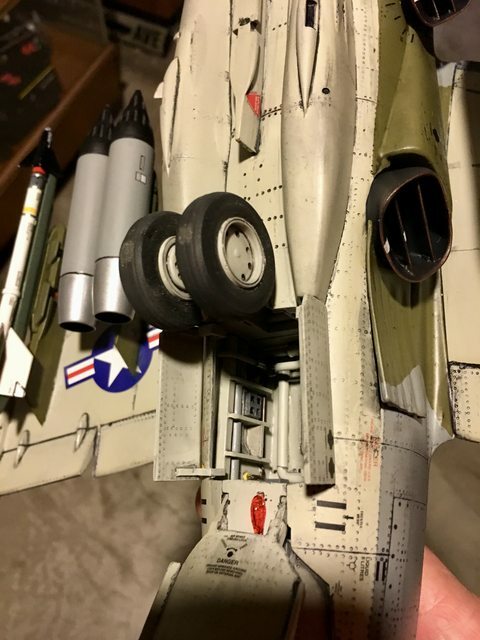 Awesome detail on Harrier! That's a great build. Really nice. Love the work you did on the wheel wells. Beautiful build! Great job on improving the detail! my only critique would be as to ordnance carried. I don’t believe that the USMC ever used the British rocket pods, but would instead use the standard US LAU type. But in 1/24 scale, I bet the options for replacement are lacking. I agree with the ordance.... and you are right, nothing to easily switch it out with. I could've added 1,000 lb U.S. bombs to those pylons but I liked the rocket pods too much. I may do that anyway..... LGB's would be even better.... hummm? But in any case, that is a beautiful build! That's a hard kit to build, but you did it! 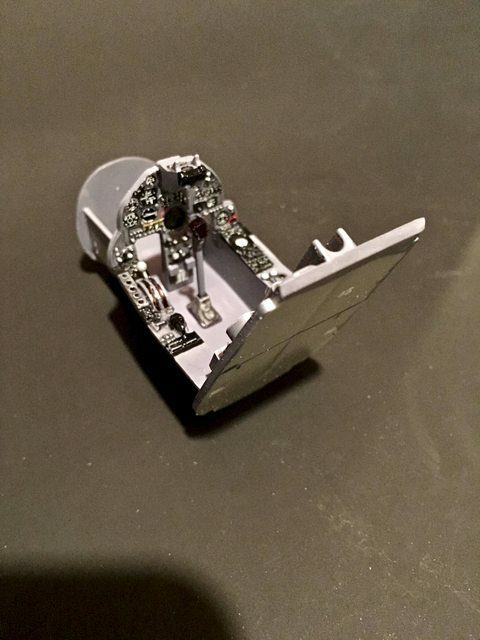 Your canopy detcord looks really good - how did you do it? I have the Gr.3 version, and it is BAD! I'm surprised no one has done a resin pit or wheel well set. The tires need aftermarket help too, but the one set I know of is not impressive. Stik, I have some of the Heritage Aviation stuff, and they are not much better than the kit. Flightpath also has PE sets; the one I have is extensive but still falls short in tarting up the cockpit. I think Airfix blew their tooling budget on the pilot figure, so the rest of the model suffered. Gotta love those divot rivets too - I had a close look at a real Harrier hanging at the RAF Hendon museum, and the skin is definitely a lot smoother. 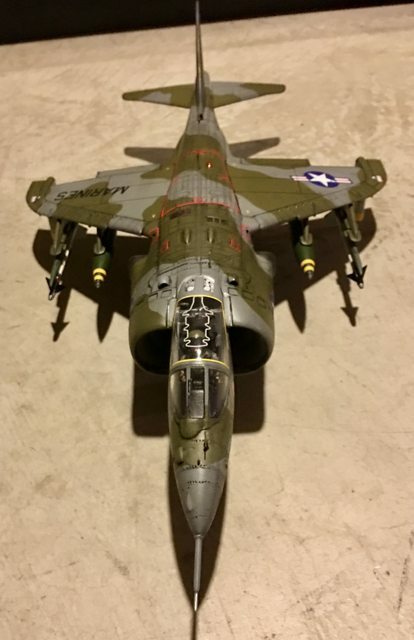 I would love to have a "new Airfix" 1/24 1st gen Harrier or a 1/32 version from Hasegawa. I could be remembering wrong, but I want to remember that USMC bought a batch of original Harriers (GR.1s?) when the Brits began the Sea Harrier (or maybe the GR.3) acquisition. As I remember it, they were bought entire, with the 30mm Aden cannon and the rocket pods, etc. The designation in the US was AV-8A. 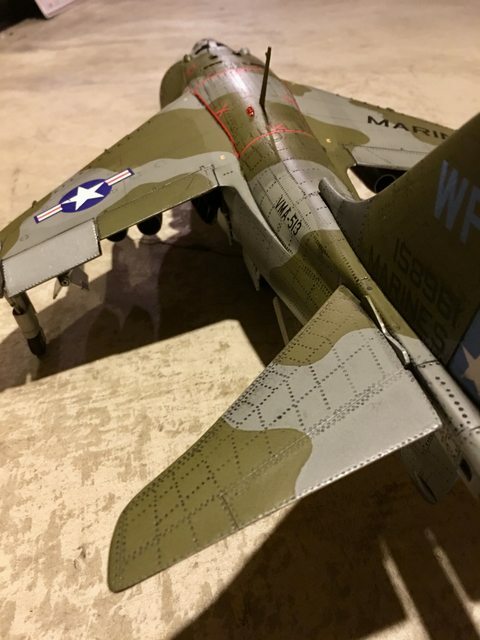 The AV-8 Bravo has the Grumman rebuilt wing and used the Vulcan rotating 20mm. There's AV-8C, too, but I can't remember if those are FRS rebuilds or AV-8A rebuilds or not. 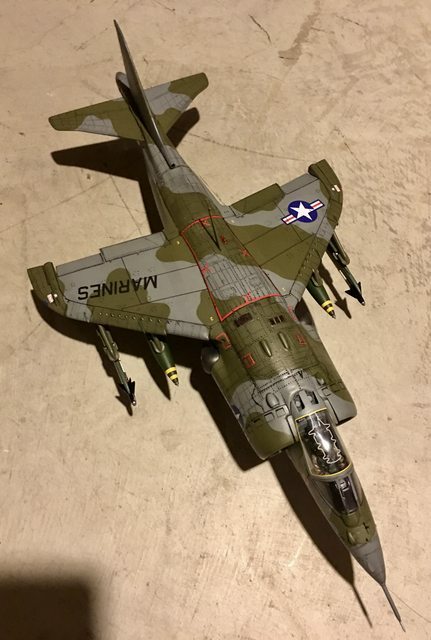 That being neither here nor there, as this is an impressive build of what I remember as being a very finicky kit that seemed meant to cause frustration in the modeler. OK, Just to make it a little more accurate, I switched the rocket pods for the U.S. 1K pound bombs. They look good too and now there should be no debate. I also added the yellow trim around the canopy and defined the panel lines. And this is actually an AV8-A, not a Bravo designation as I previously stated. Early A's did not have the det. cord while later versions did. As previously mentioned, some of the main key visual differences between the A and B are the canopy / pilot position; the center mast antenna; the increased wing and additional pylon; the thrusters, air intakes, and the shape of the tail. I agree that the wheel wells, landing gear, and cockpit are the worst parts of the kit. I ended up scratchbuilding the missing components for mine. There were many other glitches to make it more challenging than it should've been. I looked into some of the after-market products, but most everything that was good has all dried up. The decals are from the re-release of the kit and are much better than the originals. The Det. Cord is the 1/32 version from "Leathernecks". I used two of them spliced together to have it appear more to scale. The cutting and splicing was a nightmare. They are a little tricky to apply so follow the instructions carefully and have a very steady hand.